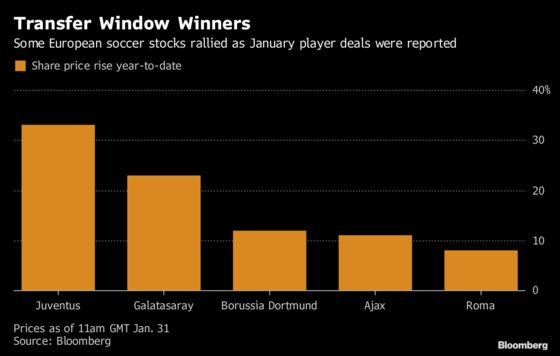 (Bloomberg) -- It’s soccer transfer deadline day in Europe, meaning clubs from the continent’s biggest divisions must complete deals to trade players by midnight Central European Time. Spending by English Premier League teams has been fairly muted, according to Dan Jones of Deloitte LLP’s Sports Business Group, who said the lack of deals is possibly due to the country’s biggest clubs being in relatively stable positions in the league standings. Outside of England, however, several of Europe’s big publicly traded teams have been busy. Below we look at the key moves, and the share price performances of those involved. NOTE: Player values are according to transfermarkt.com estimates, unless stated. Chelsea’s decision to pay 64 million euros ($73 million) for Dortmund’s out-of-favour American midfielder Pulisic raised some eyebrows, and was seen by some as a commercial decision aimed at boosting interest in the team among U.S. soccer fans. For the German club, it continues a run of big-money sales, following the departure of striker Pierre-Emerick Aubameyang to Arsenal for 63.75 million euros last year, and midfielder Ousmane Dembele to Barcelona for as much as 147 million euros in 2017. In terms of this window’s arrivals, Dortmund brought forward the signing of 19-year-old defender Balerdi from Argentina’s Boca Juniors. The fee was 15 million euros, according to Forbes. Also note that Dortmund said in November that it had triggered an option to buy on-loan Spanish forward Alcacer from Barcelona. The transaction carried a 23-million-euro price tag, Barcelona said in August. Ajax sold 21-year-old Dutch midfielder De Jong to FC Barcelona for an initial fee of 75 million euros, amid reported interest from both France’s Paris Saint-Germain and England’s Manchester City. De Jong joins an illustrious list to have played for both Ajax and Barcelona, which includes Johan Cruyff, Patrick Kluivert and Luis Suarez. The Dutch club also agreed to sell 20-year-old Austrian defender Wober, valued at 7.2 million pounds ($9.4 million), to Spain’s Sevilla. Cristiano Ronaldo’s team has been busy. U.K. newspaper reports suggest Arsenal’s Welsh midfielder Ramsey, worth an estimated 36 million pounds, will join the Italian side for free when his contract ends in the summer. Argentina striker Higuain was loaned to Chelsea Football Club for around 8 million pounds, and the London club has an option to buy the former Real Madrid star for 36 million euros, the BBC reported. Meanwhile, Juventus is set to earn 20 million euros for the sale of goalkeeper Audero to UC Sampdoria-SPA, according to a statement Wednesday. Turkey’s most successful soccer club sold 18-year-old defender Kabak to Germany’s VfB Stuttgart for 9.9 million pounds, and 28-year-old winger Rodrigues, previously reported to be a target for English club Newcastle United, to Saudi Arabia’s Al-Ittihad for 8.1 million pounds. Staying in Turkey, note that Trabzonspor Sportif shares rallied in December amid speculation that Abdulkadir Omur -- dubbed the “Turkish Lionel Messi” by local media -- could be sold to Premier League side Liverpool. The share price has since given up nearly all of that gain as both clubs downplayed the reports. Juventus wasn’t the only Italian side gaining on transfer news. Shares of Roma jumped amid newspaper reports that Manchester United Plc was interested in signing Greek defender Kostas Manolas, who’s valued at 40.5 million pounds. That transfer hasn’t materialized so far, however. United has largely stayed on the sidelines during this transfer window, with business mainly limited to securing new contracts for existing players, according to local newspaper reports. “Manchester United have done the right thing by not buying anybody major because they have got a wonderful squad,” said John Tinker, an analyst at Gabelli & Co. in Rye, New York. “They just had to use it, which they are now doing.” The team has gone nine games unbeaten since interim manager Ole Gunnar Solskjaer took over in December. However, the BBC reported Thursday that the club had sold 31-year-old Belgian Marouane Fellaini to Chinese Super League club Shandong Luneng. The fee was not reported, but the towering midfielder was contracted until 2020 and has a value of 13.5 million pounds. Fans of United, and other English teams need not despair just yet. Deloitte’s Jones says there could be a “flurry of activity” before the window swings shut tonight.